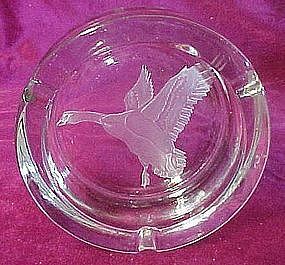 For the sportsman or woman who appreciates the best, this etched Crystal ashtray with a flying goose by Lorraine Coyle is the epitome of style and elegance. Heavy crystal and measures 5 3/4" in diameter,1 3/4" deep, and bears her signature on the side. Because of her artistry and attention to detail, master glass artist Lorraine Coyle's work is collected worldwide by celebrities and world leaders. The images on each individual piece are then painstakingly carved, by Coyle herself, in multiple layers starting with the deepest and working out to the shaded areas. After final inspection, she signs each and every piece. Pristine condition with no damages.